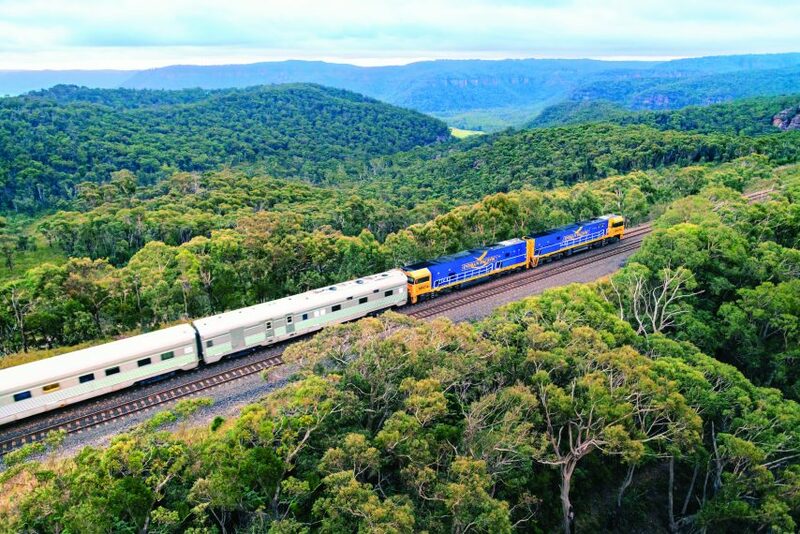 Australia’s famous Indian Pacific Railway makes a transcontinental train trip from Sydney to Perth. The IPR takes you through Australia’s lush mountains, gold fields, rocky valleys, arid deserts, and, ultimately, to three capital cities. Balanced with off-train excursions, time to relax, and luxurious comfort, this train ride was a therapeutic experience designed and choreographed to help us relax and enjoy a memorable journey. Like a river cruise, the train is more than simple transportation. Rail excursions provide travelers with a subtle rocking motion that people find rhythmic and relaxing. It’s calming, like sailing on a ship. Walking through a train carriage is like balancing yourself in a slow tempo dance. The train’s gentle rhythm is a potent tranquilizer lulling you into a restful state. You take a train ride to see the country in a way that an airplane simply can’t provide. Couple this soothing mode of transportation with luxurious cabins and gourmet food and wine, and you’ve got the perfect holiday. 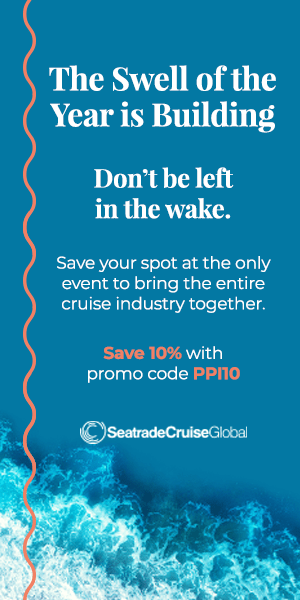 Met by attentive hosts the moment we step aboard, we’re graciously welcomed into a plush lounge with a full bar and comfortable seating. The train passes quickly out of the city, and we order champagne. The track bends gracefully into the ridges and shaved plateaus of the Blue Mountains. We toast one another to celebrate the beginning of our awesome journey. Our elegant Gold level cabin on board the Indian Pacific Railway provides ample modern comforts and a compact bathroom. During the day the cabin suite offers us a comfortable three-seater lounge that converts to an upper and lower sleeping berth at night. We enjoy music from our in-cabin sound system. Six channels give us freedom to pick our music. At night, when we retire to our soft, drop-down beds, the gentle train rhythm induces sleep. By day, we put our slippered feet up in our a nicely upholstered cabin space, and admire the wide open views passing by. We’re reminded that traveling is as much about the journey as it is about the destination. 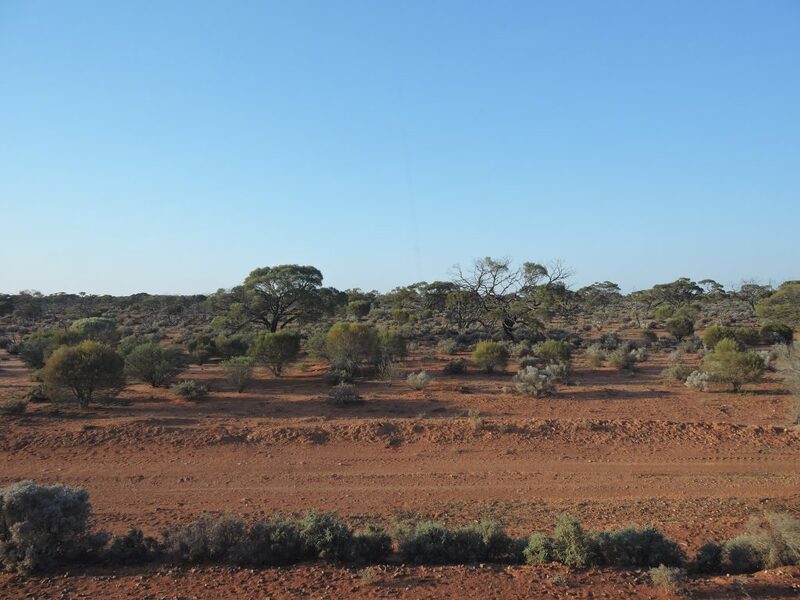 From our spacious window seats, we spot kangaroos, emu and wedge tailed eagles soaring above the arid desert. The landscape is filled with a wide range of flora and fauna, as far as your eyes can see. We’ll pass through 16 different landscapes before reaching our destination. On more than one morning we find ourselves laying on our berths, mesmerized, just staring out the window. We’ll doze off between meals. In the evenings, we head to the welcoming Outback Explorer Lounge. In this friendly atmosphere, everyone swaps travel tips over well-crafted cocktails and wine. The tables and plush seats sit next to panoramic windows the size of large, flat screen TVs. Music plays softly in the background. We easily make friends here. The dining car, beautifully decorated in a formal retro-Edwardian style, is known as the Queen Adelaide Restaurant. At each meal, we are seated at a white linen covered table next to a large window where the wild beauty of South Australia acts as the perfect backdrop for the culinary adventure. The frequently changing menu, a blend of Australian and international cuisine, features slow cooked lamb shoulder, Hunter Valley grilled tenderloin, Margaret River cheeses, kangaroo fillet, saltwater barramundi, and wild rosella flower. Local craft beer, high-end spirits, and prize-winning white and red wines from Barossa Valley, McLaren Vale, and Hunter Valley, complement the gourmet food. Passengers are mixed for the breakfast, lunch and dinner services. This mixing and pairing of perfect strangers helps us get to know our fellow travelers. Aided by the subtle, rocking motion of the train, people are relaxed and at ease with one another. Every day the train stops daily for sightseeing tours. We get an early start with a stop in Broken Hill, a frontier mining town in the Australian Outback. Passengers can choose to visit the Miner’s Memorial and Trades Hall, the Pro Hart Gallery or the Living Desert Sculptures. 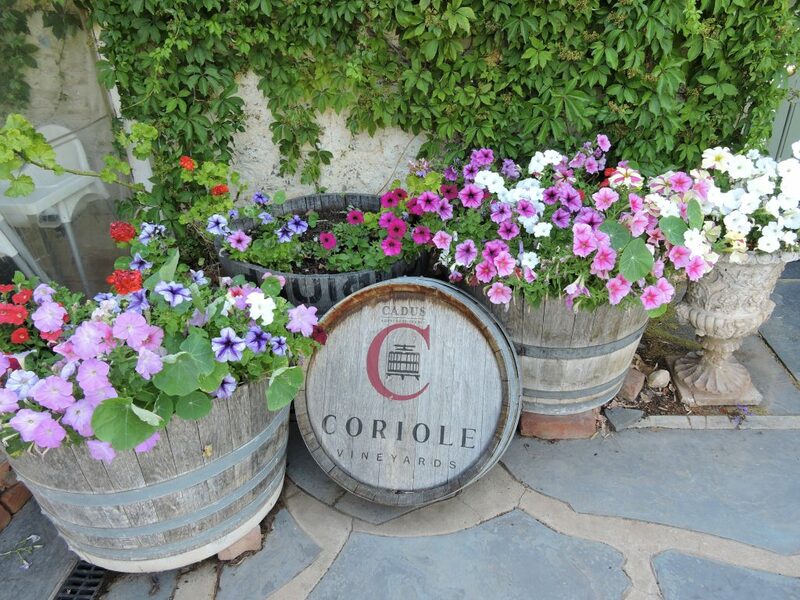 In Adelaide, we visit Coriole Vineyards, in the McLaren Vale wine region and taste wine in a private cellar door session. Next, we head to the “Star of Greece” restaurant, a short ride out the Fleurieu Peninsula, located on the esplanade above Port Willunga Beach. We have a delightful Mediterranean meal while enjoying views of the azure blue Gulf of St. Vincent. 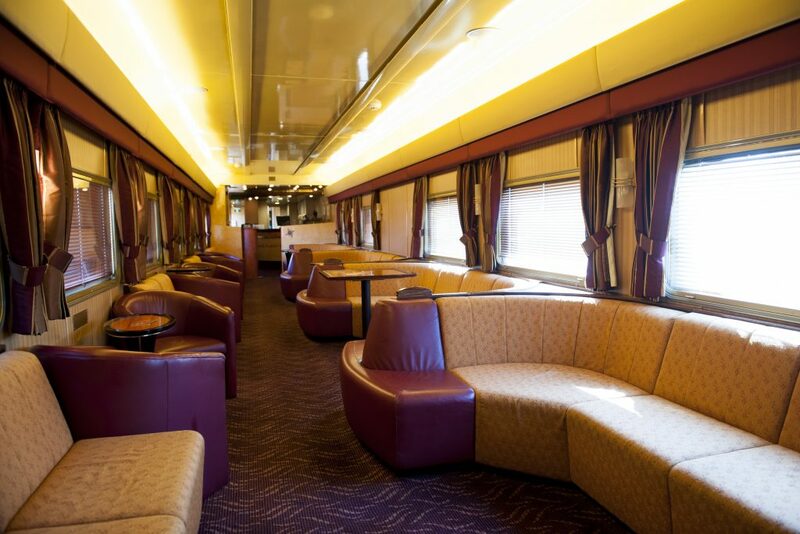 Returning to the train, we head to the club lounge for a nightcap. It’s filled with excited, chattering people. Several new people have joined our lively band of train travelers. The conversation continues well into the night. Eventually, we say our goodnights and head for our cabin. It’ll be a while until we hit our next stop. We spend a quiet afternoon reading in our cabin. After the long Nullarbor crossing, the train stops in Rawlinna and we disembark. We’re seated on picnic benches sheltered between the silver carriages and the low roofed station house, and served an Australian dinner of roast lamb paired with an Adelaide Hills sauvignon blanc and a Barossa Valley Shiraz. Bonfires set near the tables keep us warm. A live musician serenades us while we relax, enjoying our meal under an unbelievable canopy of stars. On our last day, we wake to what looks like an African landscape. Low, wide-spread, spindly trees create a thin canopy across the flat red dirt. Then, within moments, it changes into Nebraska wheat fields. We spend the morning in our cabin writing, listening to jazz, and relaxing. The lack of cell service as we traveled through remote regions of South Australia forced us to unplug and unwind. On the afternoon of the fourth day, we glide into sunny Perth and disembark. As we wait for our luggage, we realize that a journey on the Indian Pacific Railway is more than just a train ride. It’s a hidden world of shifting landscapes, rugged beauty, gourmet cuisine, and luxury. The pace of each day was enough to keep us enthralled and the relaxing rhythm of a slow cruise train ride added a therapeutic element to the trip. Winding through Southern Australia, the Indian Pacific is a world-class train journey – a memorable trip of a lifetime. Book tickets ahead of time at the Great Southern Rail website. Meals, alcohol and off-train excursions are all-inclusive. The Indian Pacific Railway departs from Sydney’s Central Train Station. We stayed at West Hotel Sydney, part of Hilton’s Curio Collection, next to Darling Harbour and the buzzing Barangaroo District. In Perth, continue your pampered journey with a stay at one of the city’s newest luxury hotels, the Westin Perth, ideally situated near the rejuvenated east end, close to shopping and major tourist sights. Adjacent to Westin Perth is the delicious Roman osteria, Garum. Pamela and Gary Baker are freelance writers based in Northern California. 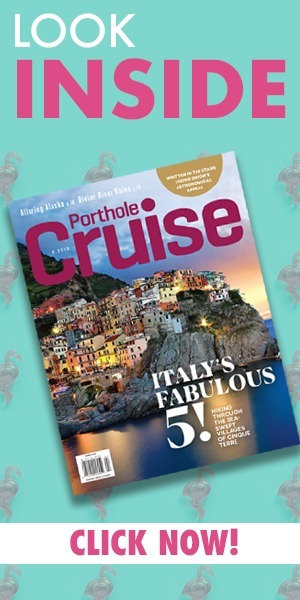 They have written for regional, national and international magazines, newspapers and websites including Via Magazine, A Luxury Blog, International Living, and Australia and New Zealand Magazine.